Well folks we’ve yet again reached the last week of National Ice Cream Month. So far we’ve played with whiskey, chili peppers, and mint, and this week we venture further off the beaten path with some thoroughly nontraditional ice cream flavors. If you’re even a vaguely consistent reader, you’ll be well aware of my love affairs with goat cheese and Olivelle products. I use both liberally in my salads, scrambles, and various entrees, sneaking them in whenever possible. M and I go through copious amounts of chévre, so fingers crossed Costco never stops carrying it. The Kirkland brand goat cheese is not only delicious but also extremely affordable. If you have a Costco nearby, definitely give it a try. For this week, the pièce de résistance if you will, I combined several of my favorite savory items into a brand new dessert adventure. This is one of those thoughts I had where I wasn’t sure if the end result would be spectacular or just strange. Fortunately for me, and subsequently all of you, spectacular was the general consensus. Step one: blackberry. Starting with a tried-and-true recipe from my trusty ice cream cookbook, I borrowed the blackberry sauce from a recipe by Molly Moon. It’s just a typical blackberry compote but I trusted her to know how much of everything to use. I liked that she suggested straining out only half the pulp, which leaves the lovely texture without overwhelming you with seeds. Step two: chévre ice cream. Inspired by the delicious blueberry cheesecake ice cream from a couple of years ago, goat cheese ice cream seemed like the obvious 2018 twist. The recipes online varied greatly in the amount used, but I took a gamble on throwing a full eight ounces in the batch and was duly rewarded. Combined into one delightful concoction, the tart but sweet blackberries blend perfectly with the tangy goat cheese. Somehow neither flavor overpowers the other but instead becomes one glorious experience: creamy, fruity, and tangy in every mouthful. The last addition was a bit of risk, honestly, but oh so worth it. Olivelle carries several dessert vinegars, the chocolate balsamic being one of my favorites. 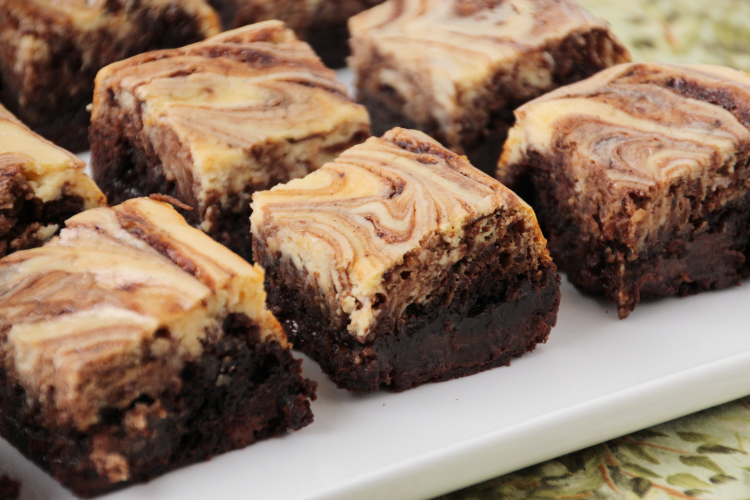 I often drizzle it over a sliced banana or vanilla ice cream for dessert, and it’s also a delightful addition to brownies or chocolate cake. With the idea that it would be a slightly more sophisticated mix-in than standard chocolate sauce, I decided to give it a chance. Although M didn’t completely agree1, my other taste testers thought it was one of the most phenomenal ice creams they’ve ever had, and I think it’s easily one of the top five flavors I’ve ever made (not that I’m biased.) The blackberry goat cheese ice cream is truly fantastic on its own, but the balsamic addition adds a depth of flavor and a hint of chocolate without overwhelming anything else. A swirl or a drizzle (or both) of balsamic vinegar takes this ice cream up several levels in both uniqueness and amazingness, and if you’re feeling a bit adventurous I truly hope you give it a try! It’s admittedly a bit more time-consuming with the various steps, and you might have to wait for an order of chocolate balsamic vinegar to arrive (although definitely check if any of your local stores are a sister of Olivelle – they are all over the nation), but I promise it is oh so worth it. I hope you enjoyed the serious and found at least one new flavor to add to your repertoire. If you give one a try, be sure and share how it went! In a small saucepan, combine the blackberries, 1 cup sugar, and lemon juice. Simmer over medium heat, stirring regularly. Mash the berries and bring to a light boil. Remove from heat and let cool about 10 minutes. Chill the blackberry sauce completely, or until ready to use. Place the goat cheese in medium a heatproof bowl. Meanwhile, in a medium saucepan over medium heat, bring the cream, half and half, and remaining sugar to a light simmer. When the sugar is completely dissolved, pour the mixture over the goat cheese and whisk vigorously until mixture is smooth – it will be somewhat thick. Chill the cream mixture completely, or until ready to use. Place a lidded freezer-safe bowl in the freezer to chill. When everything is completely chilled, whisk the blackberry sauce and 1/2 cup egg substitute into the cream – mixture will be fairly thick. Churn according to your ice cream maker’s directions. Retrieve your bowl from the freezer and drizzle with 1-2 tablespoons chocolate balsamic vinegar. Gently add about 1/4 of the ice cream mixture, and drizzle with another 1-2 tablespoons of the vinegar. Repeat with remaining ice cream (you may not use all the vinegar). Return to the freezer until completely firm, or overnight. Serve solo, with a fudgy chocolate brownie, or an extra drizzle of balsamic vinegar. 1 He thought the ice cream itself was “pretty good”, he just didn’t care for the vinegar aspect. He suggested regular chocolate sauce, which is definitely an option you can utilize too. 2 I used a half cup, but I think with all the mix-ins 1/3 cup or even 1/4 cup might be plenty, and I intend to reduce it next time. Adjust according to how sweet you like your ice cream and how much you love goat cheese. Alternatively, I think honey would make a great substitute here! 3 If you are not a huge goat cheese lover, you can reduce this amount to six or even four ounces, but I personally loved the tanginess of having all eight ounces in there. Anti-chévre completely? Feel free to sub cream cheese for a more cheesecake like experience. 4 If you are skeptical but typically like balsamic vinegars, I highly encourage you to try it! Error on the side of too little; you can always drizzle more on top later. If you think this is the grossest sounding thing you have ever heard, either you’ve never tasted Olivelle’s balsamic vinegars or you just aren’t a vinegar person. It’s okay, we can still be friends. Feel free to substitute regular chocolate sauce instead (as M suggested), but know that the vinegar adds a truly unique flavor that will definitely be lost. For as long as I can remember, mint chip has been one of my favorite ice creams. I had attempted it once or twice several years ago using mint extract, but it always tasted a bit off to me. Not like toothpaste, but just a little fake, despite using pure mint extract. Recently I came across a recipe using fresh mint, and with an overly bountiful mint plant taking over my garden it seemed a prime opportunity to give it a try. Using my standard recipe but steeping plenty of fresh mint leaves resulted in exactly what I was looking for: a strong mint flavor without the somewhat fake-seeming taste that comes from an extract. Herbier than your standard grocery store variety, this one reminds me a bit of the lemon basil from last year in that there is no doubting the fresh herbs involved. Mine turned a vaguely pale green, but your mileage may vary. I am not a fan of food coloring but will not begrudge you adding a few drops if you feel the need. Minty and creamy with the lightness that only fresh herbs can bring, the flavor is definitely one of my new favorites. The last bit to solve during my mint chip adventure was the “chip” aspect. I considered using chocolate chips but I prefer my mix-ins smaller even than mini chips, and the flakier chippy ice creams have always been my favorites. Conveniently, I attended a fantastic Italian cooking class a few weeks ago in which we made coffee gelato (I know, right?) in the stracciatella style. Traditionally, stracciatella is vanilla gelato with chocolate shavings but the process is easily used with any flavor. Simply pour melted chocolate (I used dark chocolate, of course) into the ice cream maker during the last few minutes of churning and it does all the heavy lifting for you. The chocolate freezes upon hitting the cold ice cream and the churning process breaks it up into small pieces while evenly incorporating it. My overused ice cream maker struggled a bit with the amount I used but all that really meant is I had to stir it a smidge as I put it into my bowl for the freezer – no big deal at all. This chocolate process was shockingly easy and super delicious, and I’m confident I’ll be incorporating it into other flavors in the future. Regardless as to whether you add in the chocolate, give this fresh mint ice cream a try and let me know what you think! In a saucepan over medium heat, bring cream, half and half, sugar, and mint to a light boil, stirring regularly. Remove from heat and allow to steep for one hour. When mixture is completely chilled, churn according to your ice cream maker’s directions. Meanwhile, melt chocolate in a double boiler (or in a small metal bowl over simmer water) until smooth. During the last few minutes of churning, slowly stream the chocolate into the ice cream. If necessary, gently stir the ice cream with a spatula as you transfer it to your chilled bowl. Return to freezer until firm, at least 4 hours. 1 I did not measure particularly carefully since too much mint doesn’t seem like a problem; aim for at least 2 large handfuls. 2 I used about 6 oz of 68% chocolate because that is what I had laying around. It definitely was not too much chocolate but for the health of my mixer I would likely use closer to 5 oz next time. The darker the better in my opinion but use any level you wish! Despite not being much of a whiskey consumer in beverage form, I often love whiskey-infused dishes. Whiskey can really amp up the flavor profile of a recipe, and works in everything from caramel sauce to pork chops. Having experimented with numerous other alcoholic ice cream concoctions, I wanted to play with a new liquor this year. One of the few whiskey beverages I do enjoy (other than the delightful whisky liqueur I got while I was in Scotland nearly a decade ago) is a whiskey ginger. This is actually a bit odd since I don’t always love a prominent ginger flavor, and I rarely drink soda, but somehow it all comes together in a refreshing beverage perfect for a hot summer day. Accordingly, this seemed like an appropriate thing to ice creamify. Having zero experience with whiskey, I turned to my friend the whiskey connoisseur for advice. After asking a few questions about my goals, he ultimately recommended 2 Gingers Irish Whiskey as one to put in my ice cream. This turned out to be a delightful recommendation, not only because it tastes awesome as an ice cream, but also because as well. With whiskey in hand (or rather, on the counter) I set out to create my whiskey ginger ice cream. I opted to flavor with honey rather than sugar since the cocktail itself often incorporates honey rather than a simple syrup, and it seemed like a delicious flavor match. The ginger aspect was easy enough, since infusing anything with freshly grated ginger root is both easy and delicious, but as I wanted the whiskey flavor to be prominent, and adding liquor to ice cream drastically lowers its freezing point, I knew this particular recipe could pose a scientific challenge. Round one had good flavor but was extremely soft – it never frozen beyond soft serve texture even in our coldest meat freezer. This was not quite what I was looking for, mostly because I’m not a huge soft-serve ice cream fan but also because it makes it extremely challenging to photograph and as a food blogger that’s actually quite important. Round two I used a bit less whiskey and a bit less ginger. It turned out firmer, which was ideal, but me and my taste testers agreed it lacked the punch that a cocktail ice cream truly deserves. Not to say it wasn’t delicious, but just was not quite there yet. Round three was the ultimate winner. With the knowledge that cooked eggs are how you make a proper custard, I decided to try adding the egg substitute during the heating step rather than after. As I’d hoped, this minor change allowed me to add a proper amount of whiskey while maintaining at least a passably firm texture once completely frozen. Mixing in plenty of ginger resulted in a definitively cocktail-like but still creamy mouthful. This ice cream is definitely still one of the softer recipes I have on my blog, and you will want to serve it quick, even using chilled bowls if you can. It packs quite a punch of flavor and there should be no mistaking either component if you’re using the higher end of the whiskey range. If you prefer a mellower profile, use a lesser amount; as a bonus, your ice cream will freeze a bit firmer too. A small scoop of this ice cream is a perfect summer treat, and for any real whiskey lovers you can serve it affogato style with a splash of extra whiskey on top. If you’re into it, a sprinkle of candied ginger would also be a fun addition and would give a small clue to what’s in store for your guests. If you’re looking for a new way to pare down the liquor cabinet , look no further than this whiskey ginger ice cream. In a saucepan over medium heat, bring all ingredients except whiskey to a light simmer, stirring regularly. Continue to simmer at least 2 more minutes, stirring constantly. Mixture should be quite thick – this is imperative for the final ice cream to freeze hard enough. Stir in 2 Tbsp whiskey to thin the thick custard slightly, then strain through a fine mesh sieve to remove the ginger pieces. Use a whisk in the sieve to get as much of the creamy goodness as possible, then press the remnants with the back of a spoon to extract just a little bit more. Scrape ice cream into your frozen bowl, then put in the freezer to finish firming. Due to the alcohol this recipe will always be somewhat soft (especially if you use the maximum whiskey amount) so putting it in the coldest spot of your coldest freezer is your best bet. Enjoy plain or “affogato” style with an additional splash of whiskey on top. I recommend using chilled bowls for serving! 1 If you prefer a milder ginger taste, you can use one tablespoon instead. 2 For a stronger whiskey flavor use up to but no more than 1/2 cup of total liquor; for a milder taste use just 1/4 cup. Please note the more alcohol you add the softer the ice cream will be! I used the full amount and the ice cream is permanently in about soft-serve consistency, even in our -11*F meat freezer. Each year as I add to my repertoire of ice cream flavors, I get bolder with the non-traditional palates and pairings in my concoctions. However, I also make a point to include one or two flavors that are more along the lines of “normal” for my less-adventurous fans. This is one of those more common recipes. “Mexican” or “Aztec” ice cream and hot chocolate are fairly common, but typically they are also pretty mild. Heavy on the chocolate with a vague notion of spice in there. As someone with a pretty low spice tolerance, I can only imagine that those with a higher spice preference are even more bored with these flavors. For this one, I was inspired by a fantastic legitimately spicy hot chocolate from Summit Spice & Tea Company my equally fantastic but probably less spicy aunt sent to me for Christmas: dark chocolate and with a kick – it was a beautiful match. Modifying the same recipe I used for last year’s Chocolate Merlot adventure, I set off to create an actually spicy ice cream. Given how much I loved the Maple Chipotle from two years prior, I was certain this adventure would be a grand one. My first attempt was a bit mild for what I was going for (although still delicious) so I heavily exaggerated the spices on my next attempt. Honestly it was a bit much for me (I told you my tolerance is low) but my friends loved it and thought it was perfect. Rich dark chocolate smoothly combined with the slow-burn of ground chilis, it’s one of those flavors where the heat hits you late in the spoonful rather than right away. 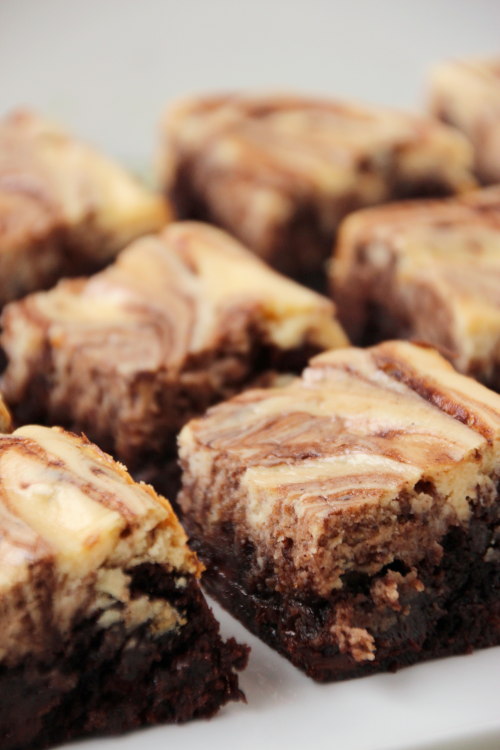 If you find your batch to be too strong, tone it down with a nice fudgy brownie and/or a drizzle of chocolate sauce. I promise it’ll be amazing. Take your next taco Tuesday to a whole new level with the perfect dessert: spicy chocolate ice cream! Place chopped chocolate in a medium bowl. Set aside. In a medium saucepan, heat half and half, whipping cream, and sugar until sugar is dissolved and mixture is just coming to a simmer. Pour cream mixture over chocolate and whisk vigorously until there are no chocolate flecks. If you are having trouble getting it completely smooth, an immersion blender works great, or you can pour it into a regular blender after a brief cooling period. Let cool on the counter about 10 minutes, then whisk in egg substitute and vanilla. Cover bowl and chill in the refrigerator completely, or overnight. Freeze according to your ice cream maker’s directions, then place in a cold freezer-safe bowl to freeze for an additional three hours, or overnight. Enjoy solo or with a fudgy dark chocolate brownie for an extra decadent dessert. 1 For reference, 1/2 tsp of each is reasonably mild, 1 tsp of each is a bit much for me but perfect for my spicier-minded friends; adjust to your liking. Feel free to use all cayenne as well (or any other chili pepper)! Brownies are one of the few things I almost never make from scratch. Costco sells 6-packs of Ghirardelli Triple Chocolate Brownie Mix which is what I nearly always use. Super chocolately, even more super easy, and the perfect fudgy texture that I love. Honestly, most homemade brownies are not as consistently good as this mix. However I have been known to doctor up the mix a bit, swirling in peanut butter or folding in additional mix-ins. 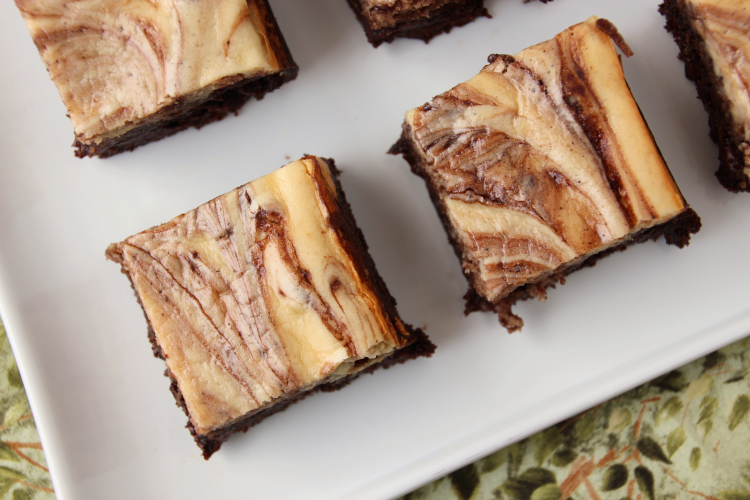 Brownies are one of my go-to desserts for potlucks because we always have them on hand and they are always well received; the fact that they only require five minutes of active cooking time is also a huge bonus. A few weeks ago I decided to try out a cheesecake swirl, blending up the standard cream cheese and sugar combination that is beloved by many. It was, expectedly, a huge hit. Given the upcoming holiday, this gave me the idea to blend in typical St. Patrick’s Day flavors as another option to add to my repertoire. Admittedly, this makes the recipe a tad more time consuming as reducing the Guinness is not a quick process. Fortunately you can do this ahead of time and just store it in the fridge until you’re ready to use it. This makes the day-of process much quicker and allows you to do the reduction while you’re already minding something on the stove. It’s relatively low-maintenance so plopping it on a back burner while you make dinner would work just swell. If you need an easy but delicious St. Paddy’s Day dessert, this could be the recipe for you. And if you’re looking for a crazier and more kapowy Guinness experience, then Irish Car Bomb Sundaes might be right up your alley. In a small saucepan, simmer Guinness until reduced to 1/3 cup¹. Pour into a medium bowl and let cool about 10 minutes or until ready to use (this is a great step to do ahead of time while you’re cooking something else on the stove). Preheat oven to 325 degrees Fahrenheit. Line a square pan with parchment paper and spray with cooking spray. Set aside. Add oil and egg and mix until well combined. 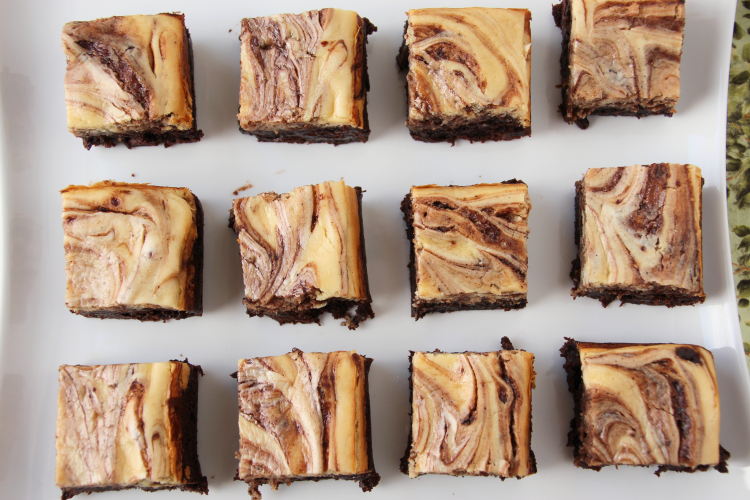 Stir in brownie mix until just combined. Reserve about 1/2 cup of brownie mix, and spread remainder into prepared pan. In a small bowl and using an electric mixer, beat cream cheese until fluffy. Beat in egg and sugar until well combined, then beat in Baileys until just combined. Spread evenly atop brownie mix. With reserved mix, add spoonfuls on to the cream cheese mixture, then use a table knife to swirl in a pattern. 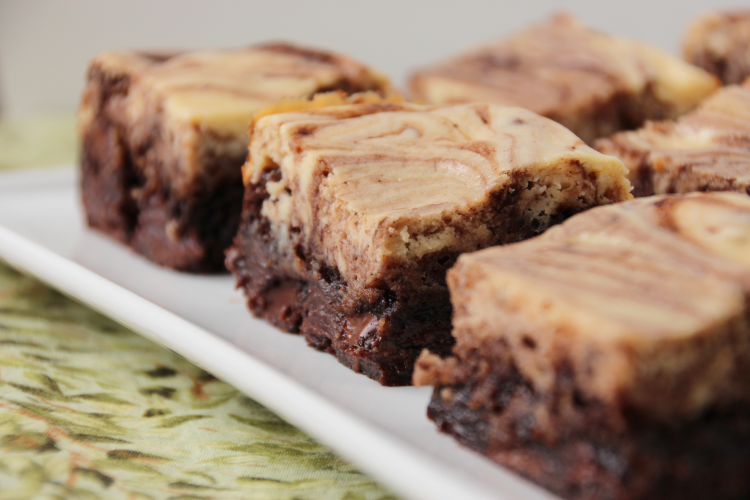 Bake for about 50 minutes, or until brownies are still slightly wiggly but not watery. Allow to cool in pan for at least 30 minutes, then lift parchment paper to remove and cool completely. Use a sharp knife to cut into squares, wiping knife between each cut for clean slices. ¹ Or however much water/oil your brownie specific mix calls for.